Ayana and Novella Lachlan are identical twin sisters, living in Italy with their mother and military stepfather. Having never been separated their entire lives, they're forced to make the choice of staying together or going their separate ways when their mother decides to return to the United States. Ayana, having met the Italian man of her dreams who happens to be the policeman she assaulted outside a nightclub, can't bear the idea of leaving him and chooses to remain in Italy. Novella, thinking that neither of them should stay, chooses to join their mother in Miami. Ayana warns her not to go. Paladio Hijuelos, fresh from a South American prison where he was beaten and tortured for three years, returns to Miami and finds the lovely and young Novella. He can't help the obsession he has for her and begins to turn her entire world upside down. Vincenzo Saletti, from a powerful and feared family in Italy, learns his baby brother is missing and must find what happened to him. What he finds is a tragedy, and the wrong girl caught up in it. Will his family give the order to end her life, or will they find a reason to spare her? Since I review so many YA books I feel the need to start out with a bit of warning for this book. Saletti Blood - The Order starts out with a glimpse of 17 year old, beautiful, blond twins on their way back to Italy from the United States and a scene where the girls are partying with friends. Do not let that fool you! This is not a Young Adult book by any stretch of the imagination. This is 100 percent an adult book! There are some very graphic, brutally violent, and sexual scenes throughout its pages! This is a dramatic novel, so it's expected, but I wanted to throw the warning out there for my YA readers, I definitely rate this as a 16 and older book. With that being said, I was a little worried at first. The book jumps right into a 17 year old world. I wasn't sure I wanted to care about twin teen-aged girls, but before I knew it I had fallen in love with the characters. I fell for the depth of emotion that these twins had to go through as they were forced to make tough life choices based on their mother's unbalanced love life, the girls' love for each other, and the man who was hopelessly in love with one of them. And that was just the beginning. As the girls went their separate ways my heartstrings were pulled, and I found myself hoping beyond hope that the characters would come out the other end alright, despite what was happening to them. And then, there was a point half way through this book where I had to walk away. I hated the book in that moment! I hated the author for doing what she did! And I also knew immediately that I loved the book and praised Vana's ability to illicit such a strong response from me. When I can read the pages of a book and have to dry my eyes or check my rage towards a hated character I know the author has done their job and done it well. Vana V. definitely wrote pure emotion into her characters and it jumps off the page and right into your heart. When I picked the book back up and finished reading it I was tossed right back into that roller coaster of drama you would expect from this type of book. I hoped, I feared, I wept, and I ordered a tall glass of vengeance right alongside the characters. If you love drama, you will love this book! It is both a heart-wrenching and heartwarming story of love, family bonds, and a tragic case of mistaken identity. While reading the book I was in contact with the author, and I was very greatful for the opportunity to ask Vana some questions about herself and her first novel, Saletti Blood - The Order. 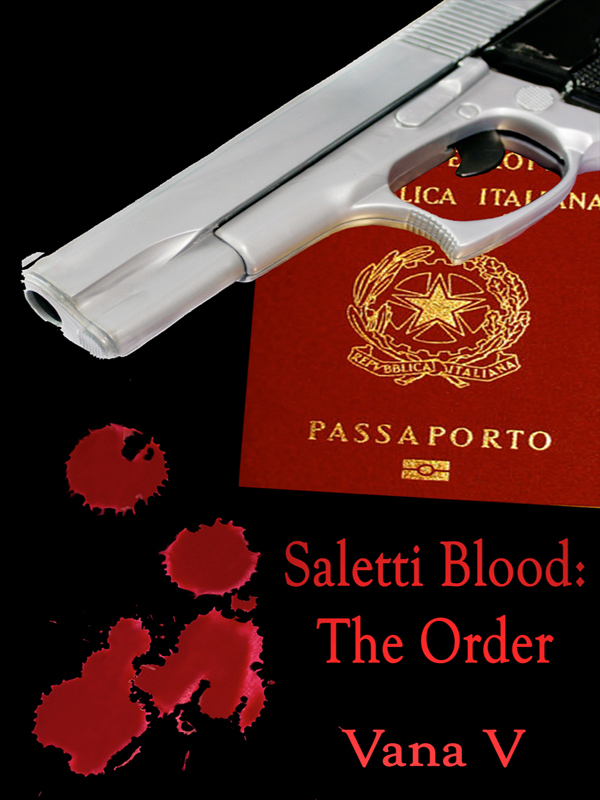 Saletti Blood – The Order is your first published book so many people will wonder just who is this Vana V? Can you tell us a little bit about yourself? How to keep this answer short and interesting? Hmmm… I can start with the obvious. I’m a military housewife and the mother of two beautiful girls, currently living along the central coast in sunny California. If you ask where I’m originally from, it’s hard to say because I’ve lived all over the United States. My father kept us on the move every year, so no place was truly ever home, though I did spend much of my childhood bouncing around Arizona. Whenever I get homesick for a place, it’s Italy. I spent many years there, where I experienced both the best and worst parts of my life. Thus, came the inspiration for this particular book, which is going to be a three book series when I’m finished with it. I have been reading novels since I was eleven, and started writing my own after being disappointed in the way I could already predict what was going to happen in the books I was buying. I suppose that’s why Saletti Blood was so much fun for me to write. I got to throw my readers off, writing scenes into the book that my readers weren’t expecting – especially the tragedy that you’d NEVER think to happen. Just when you’re about to assume something, I throw something else at you and shake it up. I write poetry, music lyrics, short stories, and now I’m publishing novels. I love horseback riding, roller skating, karaoke (which may be why my neighbors have all moved away), and I used to enjoy jogging with my dogs until I became so consumed with Saletti Blood that I disappeared inside my office to write and haven’t been seen since! What was your inspiration for this novel and the twin characters who inhabited its pages? My inspiration? Well, let’s just say that I once read “a good author writes about what they know.” Although this book is fiction and the characters are made up, there are some truths to this story – key things that I have experienced firsthand and have never been able to forget. I was seventeen years old when I found myself at the mercy of a brutal man, and when I went to the one person who should have been there to protect me, let’s just say that she took HIS side. It was the one moment in my life that I can never forget. I had never felt more alone than I did then, and THAT very moment was what inspired this story. The heartache in Saletti Blood is real, as well as the violent nature of the man Novella was hounded by. Writing this story wasn’t just for me. It was also for the young girls out there who are seventeen today (or around that age) and living in abusive relationships. This story was something I thought might give them hope for something better. We all have a Vincenzo Saletti waiting out there for us, somewhere. And if not, it’s a damn good thought! My inspiration for the twins? We’ll say they’re both a reflection of my personalities. There is a part of me who is strong – like Novella, and another part of me that has been weaker – like Ayana. Writing twins into the story gave me more options to play with, and it was also a tribute to my own sister – who was “torn” from me for years on end (about fifteen total). I had spent my entire childhood having a sister that I was forced to share a room with, and then suddenly – one day – she was gone. My life changed then as I was moved to Italy. Everything from that point on is what inspired this story. It all began the day I stepped foot onto Italian soil, which is why Chapter One starts off with the twins landing in Italy. There were parts of this book that were really hard to read (very emotional), what was it like for you to write out the very abusive, violent portions of the book? Let’s just say alcohol would have helped, but I don’t drink! It was extremely difficult. There were times when I would be typing a scene with my headphones on, listening to Matt Goss’s “Change Me” song, and my teenage daughters would walk into the room and find me crying away. I could barely type, but I had to continue on. They’d just roll their eyes and call out, “Dad, she’s crying again!” Then they’d tell me to stop writing my book because it was too upsetting. I remember telling them, “It will all be worth it, some day.” I guess that’s funny now, but a couple months ago, it was devastating to write some of the violence that I knew firsthand. You relive the fear and the feeling of hopelessness, and it can really crush your spirit when you’re in that kind of situation. I hope that I was able to paint a picture for the reader of what it’s like to be the victim in a situation like Novella’s. If you find yourself crying for her – your heart aching for this young girl who has nowhere to go, then I have managed to do exactly what I set out to do. I want you to feel her pain – to feel sympathetic toward her, and to feel a vengeance like no other for the man who is responsible for her tears. I know that your character, Vincenzo Saletti, was inspired by actor Luke Goss, can you tell your readers a little about your celebrity crush? Hahaha… Celebrity crush? Never heard it put that way, but I suppose it’s fitting. Truth is, Luke wasn’t even the face I first imagined for this character. He has light hair and blue eyes – and an English accent, and your classic Italian man has darker features and black hair like my character Tomaso – and he speaks with an Italian accent. My original Vincenzo character was more Italian, and I was having a difficult time trying to write the book while I had this darker character in mind. It wasn’t going anywhere and I was quite frustrated with the whole story. I knew I was going about my book the wrong way. I needed to put Luke Goss in the picture and rewrite the entire outline I’d worked so hard on. Putting him into the book literally changed the entire story, but it was well worth the time and energy because it made a BETTER story than I ever could have imagined. As for my own “celebrity crush” on Luke Goss, I admit it exists to a point. I’d love to meet him one day and present my series to him. After all, it was his eyes and smile that made this entire book possible. I admit I have a thing for strange socks! I was instantly humored by the Sponge Bob sock reference. Is this (strange sock love) a trait you share with your character, Novella? LOL, no! In fact, I love my tiny white socks with nothing on them. I don’t like any designs or colors. However, my oldest daughter refuses to wear plain white socks. You can open her drawer and find anything from Sponge Bob to Transformers! I have no idea why she loves crazy socks, but it gave me the idea to throw that into the book. After all, Vincenzo never knows what to expect from Novella, so it was just a little something more to humor the reader with – and to show she was still just a kid in the midst of all the drama she was forced to deal with. Do you have another novel in the works? If so, tell us a little bit about it. If you could meet your own character, Novella, what advice would you give to her? “Run, Forest, Run!” Why do those words come to mind with a light laugh? Seriously, what would I say to her? I suppose I would commend her for keeping her head up through it all, for not giving up on her life when things couldn’t have gotten any worse. I would tell her that “blood is not thicker than water” – that sometimes it’s okay to walk away and stand up for yourself. I would praise her for telling Paladio off that night, even though it cost her a great deal of pain, and I would praise her for sacrificing her own selfishness to be there for Vincenzo when he needed her. She had to grow up fast and cope with a lot – things that most adult women haven’t even been forced to deal with, so that’s something she should be proud of and I’d tell her so. She’s a strong girl. I would like to take a moment to thank Vana, once again, for answering a few questions and to wish her the best of luck on writing the rest of her trilogy. Perhaps we should all chip in and ship her some Kleenex for the process! If you love a good drama, and you're ready for that deep kind of read where you fall in love with the characters (or loathe them completely) and live through the real emotional struggles that they face (both good and bad), then you really need to grab this book. It's the little unassuming black book with the red writing that packs a very powerful punch once opened!